This entry was posted in Random and tagged Barbara Pyett, Billy Crystal, Humor, Humour, Meg Ryan, New York City, Pecan Pie, Shakespeare, Two Gentlemen of Verona, When Harry Met Sally. Bookmark the permalink. See what good things happen when you stop running for a second? Pecan Pie!! I’m not sure but isn’t it the case back in Shakespeare’s day that the opposite was true….the men played women? In any event, the three of you make awesome lumber-sexuals! I have so enjoyed reading this…because of pecan pie, of course, and the steak knives and, well, I am not a movie fan, so that part I have to appreciate vicariously. But best of all, for me was the bringing up of all kinds of memories of my days of gopheriing, performing and even directing in local community theatre…..the auditions with a plethora of women turning out, and only two men, the creative costuming and set design, the wonderful in-jokes and ad libs during performances…..strange cast parties. Thank you for a prompt to some wonderful reminiscing about my mis-spent but very much enjoyed youth! Oh, I’m so happy to have made a trip down memory lane with a fellow community theatre thespian. 🙂 I’ve never really understood the lack of male actors when our televisions and movie screens are dominated by male roles. Maybe men aren’t keen to do it for nothing and just for fun? In my experience, most of the men were involved because their wives were, or gay. The women competed–fiercely sometimes– for major roles, and the males waltzed in with little competition. Some of those guys were not such good actors, but who was gonna tell them that? I do think vanity was a motivator, since there was no money in it. For me it was just great fun. I especially enjoyed the musical comedies, and can still remember the words to all the songs…. What a great post!!! I love the beanie beards, so innovative! Just so creative, someone has an amazing brain! You know what? You are adorable. Even with a mustache. And I envy the hilarity you are having. Or is that I am jealous? Who cares? I’m happy to hear that you are having a boatload of fun with your troupe. Yes, friends, you are gonna need a bigger boat. 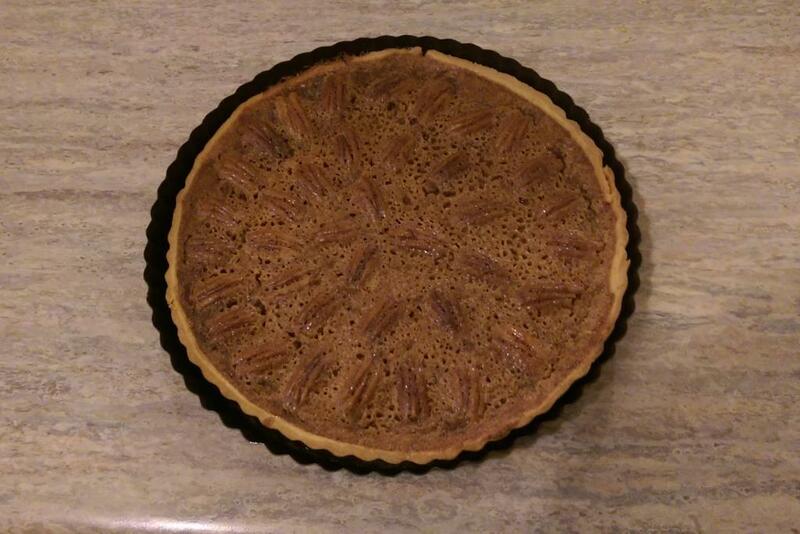 2) I can’t believe all the pecans in your pie are so neatly arranged. Mine run helter-skelter without a plan. 3) LOVE the knitted beards. 4) did I say already that you’re hilarious? 6) now, thanks to Maggie, I’m going to be thinking “gonna to need a bigger boat” for the rest of the day. 2) That’s Mathematician Me. She likes order and patterns. She doesn’t cope so well with helter-skelter or even higgledy-piggledy. 3) So did we! So much so, they let us keep them! More fun to be had…. 6) Oh, me too. But I can think of worse things to think about for the day. I have to go and watch Harry and Sally again! This reminded me of the wonderful production of Julius Caesar my son-in-law directed, using second year drama students. Half the conspirators were female… it worked a treat. You’ve been having marvellous fun, eh ? Oh, I think you should work on that! I’m hungry. It’s all your fault. :-p I can’t think of a movie that threads through my life, but a certain science fiction TV show seems to be a big part of it. I was watching an episode the other night and I actually thought of you because one of the characters was eating peeeecaaan piiiiieeee!!! Too funny! What fun you’ve been having! There’s nothing like enjoying yourself immensely and being a little silly at the same time. You all make very mean looking villains with your woolly beards. I look half-crazed but I’m not sure that’s acting. We had a ball even during rehearsals. At one, when I and another outlaw ran off through the doors, there’s a little alcove and then a right turn to the door outside. My fellow outlaw, who was carrying a broom handle for a weapon, got it stuck in the corner of the alcove and suddenly stopped. I ran straight into the other end of the handle. It was a classic piece of slapstick. We came down with a drastic attack of the giggles. We had to wait outside the door to do the aforementioned run down the side of the hall and we were desperately trying not to be noisy while in fits of giggles with tears streaming down our faces. It sounds like you had a wonderful time. Just reading this story is making me laugh too. Don’t suppose you home deliver? 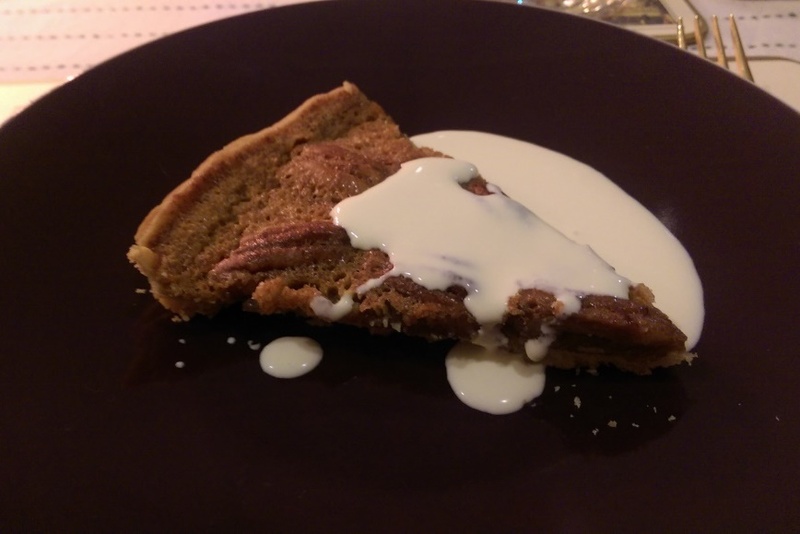 The pie, not so much the beard…. I think home delivery would have to involve the beard in some capacity. Who knitted the beards? I have never seen knitted beards in a shop. I wonder if pecan pies can be knitted, if so, next time you could all run around wearing pecan pie tops shouting ‘beards, beards.’ Very Shakespearean!. We bought them in a shop! I kid you not. A quirky little shop in town. People are so clever and imaginative. I love that idea. A hear that more Shakespeare is on the cards for later next year. I shall mention it to the director. It was very simple to make, Jude. Go for it! You are probably the only person I know that can artfully, comfortably, and masterfully segue from pecan pie to Shakespeare and have it make perfect sense! Your posts are so much fun to read and I’m most impressed at your ability to make fun wherever you can. Some day, I really must meet you in the real world….. Thanks for showing me your marvellous pecan pie Heather! The play sounded a riot and great fun. As for your last question, I’m probably at the stage where films like ‘Enchanted April’, take me back to imagined holidays in Italy. (not wanting to go physically, as it would never be the Italy I knew, as those I knew are no longer with us). I think it’s lovely when movies can tap into our own memories. And there’s so many fabulous movies about Italy, you’d be able to feed that as much as you wanted I would think. I’m so pleased your pie cooked in the correct time. Maybe I didn’t measure things properly, and our oven is a tricky one that recommends everything 20 degrees lower than the recipe! Crazy, but good when I get it right. Good luck with the little ones. Usually I’m catering for 14 to 17 people and so I must make multiple things. This often leads to second helpings as it’s not often a number that divides equally (16 works, 15 does not). On this occasion, only eight of us could make it so I prepared only one pie which was duly cut into eight pieces. No coming back for seconds, I’m afraid. Guess I’ll just have to make it again. The beards are hilarious, and so is this whole post! I need to re-watch “When Harry met Sally” … it’s been way too many years. I have to admit that I’ve never had pecan pie!!! Yes, you must re-watch. One always benefits from another viewing. And that’s really a pity, because WHMS is one of my favourite movies, too! In fact, we’ve just bought a digitally remastered version of the movie on DVD because we like it so much! Oh, I’m sorry you’ve been sick. I hope your reappearance means you’re feeling better. Love it – both the post and pecan pie. What fun and it sounds like it has become a phenomenon in the blogoshphere. What next? Pecan pie Phot challenge? Or even just a Pie Photo Challenge. So I could pull out the pecan pie AGAIN. Let’s start campaigning. Who knows the right people?? H I am struck by the fact that you have a few million things going on in your life ad then on the side a live play. Wow! oh and you are backing pecan pie. I’m with Joanne on the astonishment of the perfect symmetry of the nuts. I used to have a baking business and I an assure you even in those pie making days, my pecans needed to be herded in to their pan and they were not nearly cooperative as yours. I can add nothing, but didn’t want to sit silent on the sidelines. Funny post, funny you, much admiration here. If I had time, I’d rewatch the film–remember it as funny, but dont’ recall any scene except Meg’s “oh”s. Perhaps the romance made less impact on autistic, never-had-a-romantic-relationship (thus more skeptical) me. When I get the time, I WILL rewatch, ’cause my curiosity over the pecan pie reference is killing me. 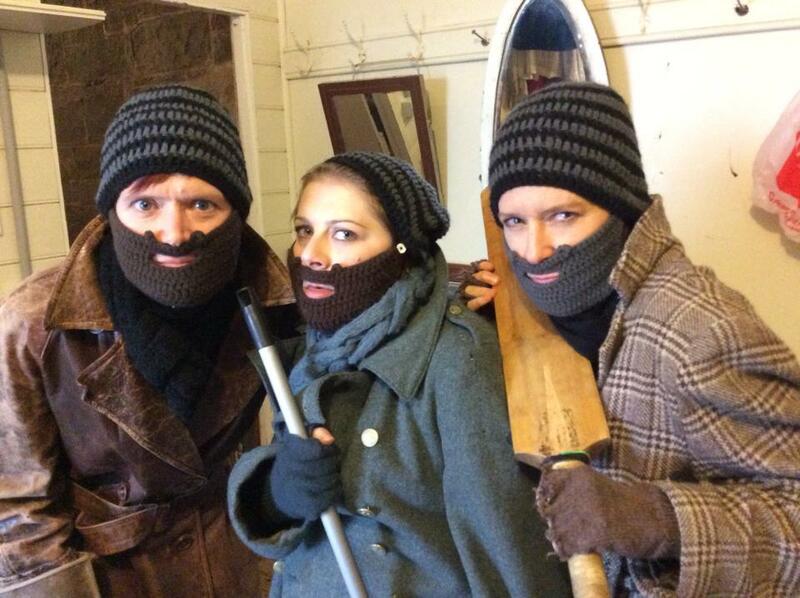 I so love your knitted beards! I need the recipe …. forget the pecan pie! Honestly, this post is soooo funny. Thanks for kick-starting my day. Thanks, Su. 🙂 We found those knitted beards in a shop, would you believe? Who thinks of these things?? The same people who knit those doily things to put over the spare loo roll perhaps? Funkier than loo roll covers! The grass really is greener (metaphorically, naturally) on the other side of the ditch!